You should be familiar with your handgun and basic firearms safety. If you've never taken a firearms safety course the Friday night classes at Iron Sights are a great and inexpensive way to get your skills up to speed. On the range the Range Safety Officer's word is law and, while we want everyone to come out and have a good time, safety is paramount. In addition to your handgun, you will need at a minimum 2 magazines (pistol) or 3 speed loaders (revolver). For the advanced matches this jumps to at least 3 magazines or 5 speed loaders. A safe holster, one that holds the handgun securely with the muzzle pointing straight down or nearly straight down is required for all matches except the steel match, which may be fired from the low ready position. In addition, for all matches except the steel match you will want to have belt-mounted magazine pouches (it is possible to use a pocket, but you will be at a disadvantage). 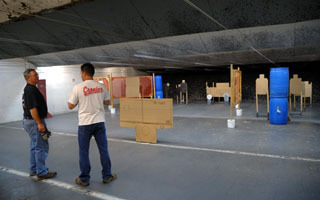 Range is Safe - it is now safe to go downrange to tape targets, etc. The easiest match to get started with is the Fun Steel Match, held on the first and third Thursdays of the month. The steel match requires the least equipment, and doesn't require reloading on the clock or movement. We often shoot 3 strings per stage, so if you only have two magazines bring extra ammo to the line so you can quickly top off a magazine before the 3rd string. When you show up for the match sign up and pay your fees at the front desk (tell them you're there for the match - there's a separate sign up sheet). They will give you a score sheet (usually) - don't loose it. Sign up not later than 7:00PM, if you're late you will not be allowed to shoot. Enter the pistol side of the range and find a spot for your gear. Shooter's meeting usually begins just after 7:00PM, followed by a short briefing for new shooters. Remember we shoot with a cold range - no handling or loading of your firearm once it is in the holster except under the direction of the Range Safety Officer. If you don't have a holster and will be shooting from the low ready position your handgun should remain cased until you reach the line. The cased handgun may be left on the bottom of the cart on the firing line. If you're still not sure you can always stop by on a Thursday night just to observe and get a feel for how the matches are run. Remember to sign in at the front desk and tell them you're just there to watch. You can also visit our video gallery to learn more.